An artistic rendition of the Dream Chaser vehicle launching into space. A private space plane developer has passed a key design test, checking off another milestone on the vehicle's path toward carrying astronauts into space. 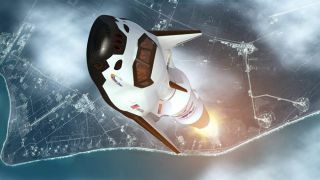 The aerospace firm Sierra Nevada Corp. completed a preliminary design review (PDR) of its Dream Chaser space plane, NASA officials announced Wednesday (June 6). The review vetted the planned spacecraft's entire orbital flight program, including its mission and ground systems. The design review comes just a week after the Dream Chaser's first flight test, during which a heavy-lift helicopter carried a full-scale model of the vehicle through the skies near Denver to test its aerodynamic performance. The Dream Chaser, which looks like a miniature version of NASA's space shuttle, is designed to carry up to seven astronauts. It will launch vertically atop an Atlas 5 rocket and land horizontally on a runway, like a plane. Sierra Nevada officials are hoping to conduct the first approach and landing tests with the Dream Chaser later this summer, and they've said the vehicle should be operational by 2016. The Colorado-based Sierra Nevada is one of four companies that have received funding over the last two years from NASA's Commercial Crew Program (CCP), which seeks to spur the development of private American spacecraft capable of carrying astronauts to the International Space Station. The other three firms to get money are Blue Origin, Boeing and SpaceX. NASA hopes at least two of these companies can have vehicles up and running by 2017. After the retirement of the space shuttle program last year, the agency became dependent on Russian Soyuz vehicles to ferry its spaceflyers to and from low-Earth orbit. Blue Origin is developing a biconic craft called the Space Vehicle, while Boeing and SpaceX are working on capsules, called the CST-100 and Dragon, respectively. Last month, Dragon became the first private vehicle to dock with the space station during a historic demonstration mission that aimed to determine if the capsule was ready to start making a series of 12 robotic cargo runs to the orbiting lab for NASA. SpaceX is also developing a manned version of Dragon, which it hopes will start carrying astronauts within the next three years or so. Blue Origin and Boeing are also making good progress, NASA officials said. CCP program manager Ed Mango said. Follow SPACE.com for the latest in space science and exploration news on Twitter @Spacedotcom, Facebook and Google+.